Thanks both, I changed rears to 17 yesterday before driving home, definitely better and the front could probably do to be a bit softer but they're not quite so easy to change, I'll do them in a day or two. CG swapped my springs as the cabriolet bodyshell isn't as stiff as the coupe - and what they didn't want was the shell itself to become part of the suspension which might be the case if the springs themselves were too stiff. Which means I've got a set of Ohlins springs, taking up space in the garage if anyone wants them? Do you know what spring rates they are and can I ask how much they were? Are they custom made or something they have in stock? 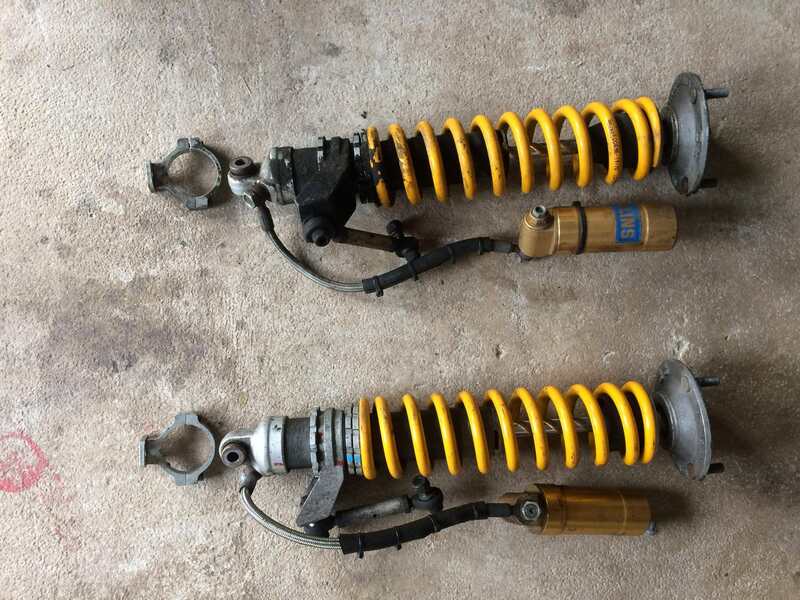 The springs I used are the standard Ohlins springs that come with the dampers, They are about £2,400 and I got 10% discount from Design911. What sort of cost are we looking at for fitting by CG? Ball park figure is fine. 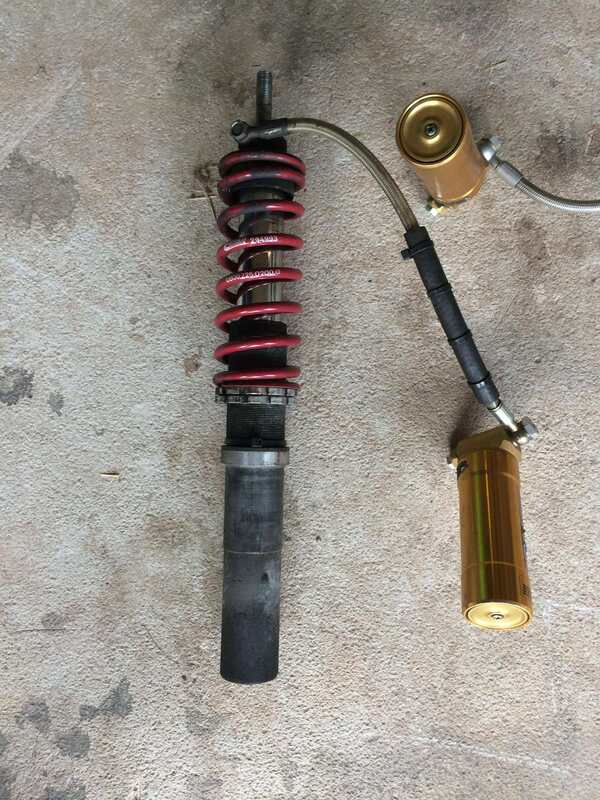 They charge by the hour, (about £100 inc VAT) and it depends on what else you have done and how easy it turns out, I had all the suspension arms and inner and outer track rods replaced too but mine came apart very easily. The first day was fitting all the new parts, the 2nd day finishing off and setting it up. It's not cheap and they do have a standard process including assessing the car 'as received' before starting work. Their standards are very high and they are meticulous. I decided to use them as a 'one off' and I hope the suspension is now done for some years although I may still end up with softer rear springs after my summer hols. I detailed the costs in my thread (link below), have a dig through and you'll find them, IIRC it was just over four grand including all parts, not including tea. I'm with you on that Mike. When I drove Craig's, one thing that stood out was when the road surface changes or you cross expansion joints and you get that slappy thud from the rear tyres. I'm sure I read the std Ohlins rear springs supplied are something like 100 or 120lbs. I think the ones they fitted to the Porsche mag guys car were 60 ish. Almost half. I've been telling Craig to get onto Ohlins as you shouldn't have to pay £2500 for coilovers, to then have to buy softer springs. They should be offering replacement springs to all previous buyers. He's going to CG first for a setup and see what they say, as there was a mention of the 911 mag car now being too soft now. I must stress Craig's is still to be setup. All camber and toe settings are all over the place until then. The joys of modification eh. Just checked my invoice from CG - I've got 90Nm/mm rear and 40Nm/mm front. Stock they're 60 front and 120 rear. Right. I thought 60 sounded low as I typed. So a 25% reduction on the rears. Quite a difference. It makes you wonder why Ohlins sell the kit so stiffly sprung in the first place? Obviously for the track lads. Wish I'd know that before I went to CG, your car rides very well. CG encouraged me to stick with firmer settings, they stressed that Steve Bennett's car is a bit soft bet I think he went much softer than you. I'll try different damper settings before changing anything else. I went down the same route. Full suspension refresh and Ohlins at CoG. It was a hefty bill at the end of my two days at CoG. Two years down the line it feels with money well spent. The Ohlins are flawless and the road set up gives me confidence to take on uneven B roads with confidence. It's a fallacy that stiff springs are the only way to make a car handle. Many years ago, Chris at CG and I coined a phrase that "compliance is king" and when it comes to road cars, it's certainly true, and with the continued deterioration in our road surfaces, it will become a necessity. There is however a caveat, you need a certain quality/standard of damping/damper to be able to run compliant springs and retain decent body control. Exe-TC run 35 front, 70 rear. I wonder what spring rates M030 uses? great thread - i am also on the path to the Ohlins R&T setup on my 996t. Just coming to terms with the fact that this will be an 'unnecessary' 3.5-4.5K outlay....given there is nothing wrong with my car at present. Interesting thread. I know I need to do something with my suspension and would really like the Ohlins kit. I’m expecting to need to do pretty much everything so getting my head around the potential cost is taking some time (and I don’t have a penny of the money at the mo!). i typically run 17/15 f/r on the ohlins (expertly fitted & setup by Matt @Fearns) on the road or 15/13 if smoother surfaces and its where i find it works best.... much softer than 17 and the front washes out wide very quickly and the rear won't give the stability needed when under heavy load. ran at Spa a cple weeks ago (saw 260kmh on Kemmel) and was running 3/1 f/r and the comment from my instructor (a pro GT3 class racer) was that it still seemed to power-boat a bit... ie the rear squatted too much and the nose lifted too much... i guess stiffer springs would be the answer but for my driving level I had no complaints. Despite that, the car was pretty amazing on track, and i was astonished what he was able to get out of it... so much fun and mega pace... well into the 2min40s for reference. ultimately theres a couple of constraining issues for most near stock/mildly upgraded awd 996tt's on track and thats lack of front tyre width, and lack of neg camber you can dial in but my car is 95% road focused so ultimately not an issue for me. Interesting to read that ZeroH. Mine now runs 16F 15R as they seem to have softened up over the 600 miles since fitting. What have you ended up with geo-wise? I'm booked back into Matt's this weekend for some further tweaks on mine, 996T, Tip. By the way, that is a searing time at Spa! Are you on Cup 2s? And is your car black? If so, think I saw it at FS back in June.